The first realm of the Dragon Realms, and the first that you'll be visiting. A rather annoying help feature will be displayed straight away. Trina is a small fairy that will popup at random points to tell you about things, mostly only useful if you're brand new to the Spyro series though some of it will be useful for those of you who have played previous games. While the game recommends you go talk to Moneybags, I recommend that you don't as it can cause a glitch to occur which means that you can't access his shop properly once you do get 500 gems. Therefore, collect at least 500 gems before talking to Moneybags just to be safe. It won't always happen, but there are reports of it. After talking to Moneybags (though do it before talking to him) you'll need to collect at least 500 gems and then go back and talk to Moneybags again. In this part of the level, gems can be found in a variety of places. And there is a possible total of 545 gems you can get before talking to Moneybags. Once you have enough, go talk to him over by his shop. Not the most difficult of challenges, just talk to Moneybags, he'll lead you into his shop and it'll activate itself automatically. The Lock-Pick looks like a key with Sparx on one end. And it costs 500 gems. Just walk (or charge) over to the locked gate just to the left (west) of Moneybags' shop. Sparx will open it up for you. Continue along this newly opened tunnel and Zoe will give you the usual speech about saving your position, but in this game that's exactly what it does so watch out for that auto-saving icon if you're going to be switching off your console anytime soon. Always Quit to the 'Front End' before turning off this game as that auto-save feature can screw up your save if you turn off while it's still going on. Anyway, go over to the dark gem and Ember will start talking to you. She'll 'give' you this task even though you already had it. Ah well. Get some more gems here if you want, then head over to the closed gate, step on the switch and go into the cave. Just to the right of the inside of the entrance you should see a cracking wall. Charge into it to find some extra gems. Nothing special this time, but other cracks in the wall like this one can hide important items such as Dragon Eggs or Light Gems. At the end of the tunnel, you'll find the blue coloured Elder Tomas who'll give you the power to both Double Jump and Horn Dive. That second task will popup now, though you won't complete it for a while since there are other levels involved in that one. Simply double jump up onto the ledge opposite the Elder Tomas and perform a Horn Dive right next to the large Dark Gem there attempting to get it as dead on as possible. The scenery will lighten up and vines will retract, as well as opening up and exit for you. Jump up to that exit and follow the tunnel along out to where you'll meet up with Hunter for the first time this game. Hunter offers to open the door for you if you find a Dragon Egg and get back to him safely. This'll involve a lot of Double Jumping and gliding, some of which is more difficult then others. If you like gems, head down to the floor beneath the platforms where Hunter is standing and collect all you can. There are a few places down there that if Horn Dived, they will smash open and give you gems. These look like rocks but have a circular pattern on top. Anything that has a circular pattern on top is almost always Horn Diveable. On the way back up to Hunter, you'll notice a Strong Chest. This will need something strong in order to open it up. You can ignore it just for now though as you can't reach the thing that'll smash it open just yet. Once you're ready to go, glide onto the series of platforms leading away eastwards and as you reach the end of this section you'll come across the first ever enemy of the game. An un-armoured Gnorc. As you glide over towards it, flame. This should hit it upon you landing next to it and thereby killing it. Gems will then explode out of him. This is the cause of unlmited gems in this game, all enemies will keep giving you gems each time you kill them, though they won't respawn until you either die yourself, or re-enter the level, though those that won't give gems usually won't respawn either but they sometimes do. At the end of this short tunnel, you'll find a large open chasm with platforms in. Same as before, except that if you fall you'll die. Though having Zoe right at the entrance and having unlimited lives does help a lot. The second platform will again have a Gnorc on it, flame and land. A slightly more difficult glide next, but it shouldn't be too much of a trouble if you press jump the second time at the highest point of your first jump forwards. Stand on the button and go inside. In the next room you'll find another new enemy. The Gnorc with a Sword. This one can either be charged or flamed, your choice, though it will still try to attack you either way. The first of the dragon eggs in the game. This one is pink with daisy designs on it and is found in the room just after this one. 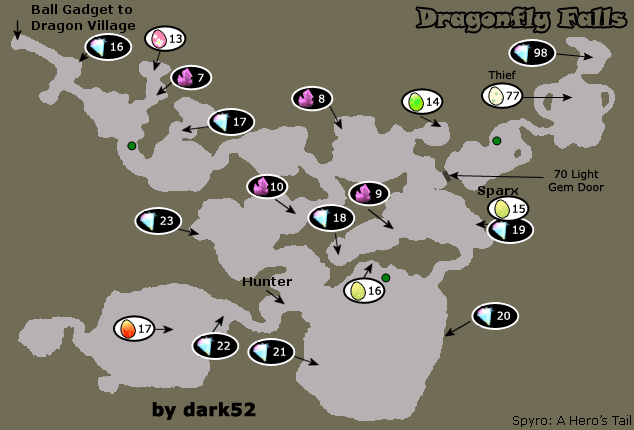 Dragon eggs are similar to Dark Gems in that you'll need them to complete the game to 100%, but they aren't quite as important as they aren't needed for just completing the storyline. 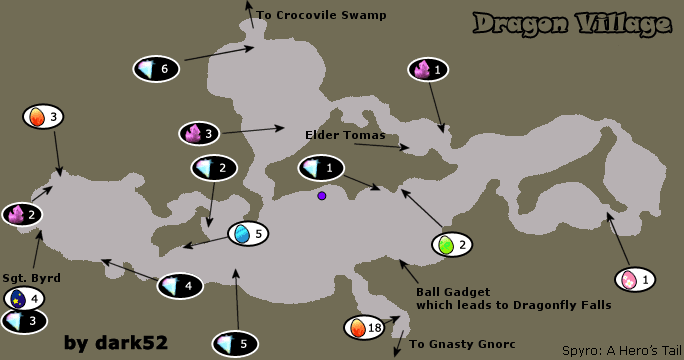 There are eighty dragon eggs in the game, each of which belongs to one of eight sets, with each set having ten eggs. Once you complete a set of eggs, you'll unlock a special something from the Front End. Your current sets can be viewed by going to the map, and pressing the button for the Status Screen. Head out the door to an area with one single Gnorc in, and a few gems. As well as the first Horn Dive chest. Also, there are two Fire Bombs here for you to use. They are 'powerups' for your fire breath, very limited and overall not that useful unless you have a lot of them and enjoy using them as well as spending lots of gems on getting more. The first armoured Gnorc is waiting just around the corner. As you go into the tunnel now, charge into the armoured Gnorc and then flame him. This will take care of him, and is how you'll be taking care of Gnorcs like him throughout the game. Right at the end of this tunnel, you'll find a firework to light. Light it and it'll destroy that Strong Chest you met earlier. That's right, we're back at Hunter again. Collect the gems and talk to Hunter again. He'll open the door for you now, and so go through. Wander on along here, and take out the first armoured Gnorc there. Behind him is a locked chest, which you'll have to come back a bit later to open up as you won't have a Lock-Pick on you at the moment. Carry on past here, and talk to the hologram Professor. He'll yatter on about collecting things. Eight Light Gems will be what he finally settles on, he'll also open up the door to the nursery too. This task, like the Dark Gem task, won't be completeable for a while. Head through the door the Professor just opened up and you'll automatically see a bunch of Egg Thieves stealing some Dragon Eggs. Nanny will explain about eggs here. Once you're done talking to Nanny, turn around and straight ahead you'll see the first of the Light Gems. As with Dragon Eggs, just walk into it to collect it. Head out the door the thieves opened, and you'll find yourself back out at the start of the level with Moneybags on your right. Buy a Lock-Pick off him and head back through to the locked chest you couldn't open earlier. Inside the locked chest just before Nanny. Head back through the Nursery again and over to the far side of the opening part of the level to where there was a ledge that required Double Jump. And suprise suprise, you've got it now! Make sure to have a Lock-Pick here, as the chest straight away contains something very nice. Inside the chest at the entrance to the west-side of Dragon Village. Double Jump required. Go through the tunnel here, kill the armoured Gnorc and out into the large open area at the end. To the right of the entrance, you'll find a round red and white target just at the right height for charging into. Once you activate the switch in the far-west area of Dragon Village, several platforms will raise up. Jump up onto the nearest one as it goes up, and then onto the next highest. Then jump off to the side where this dark gem is awaiting. Just inside the small opening made visible by destoying Dark Gem 02. Jump back down to ground level, and talk to Sgt. Byrd over by the purple portal. Say yes. Basically what you need to do here is get all of the targets as specified at the start in the time limit given. Easy Mode is for a Dragon Egg, and Hard Mode is for a Light Gem. With Hard Mode you just get less time to start with really, though the things are also spread out differently too. Here you'll be getting Rings, Time-Gates, Targets, Gnorcs and Vultures. You'll also be given a 3 minute time limit in which to get all these, though going through Time-Gates gives you +5 seconds, so you could count that as 3:40. First off, take off and head down towards the time-gate on the right. Fly through it and along through a few more, shoot anything that gets a target to appear on it. Go through the rings at the end here, and then through another Time-Gate, a ring and then shoot a Gnorc. In a short while when you get to an island with several Gnorcs on, make sure to get all four. Right ahead, you should get the last two remaing Time-Gates as well as the last couple of Gnorcs, then head off towards the flock of Vultures and take all eight of them out. Just past the Vultures you should find the last of the Targets to blow up. If you're still missing anything, then fly around the level looking for it/them. Complete Sgt. Byrd's Mini-Game in the far-west part of Dragon Village on Easy setting. Once you've compelted it on Easy, go onto the Hard setting in order to get the Light Gem. This requires faster shooting and better tracking down of things to shoot, the above strategy is useless as the things are all in different places now. There are now Gnorcs up on top of the towers in case you wanted to know. Complete Sgt. Byrd's Mini-Game in the far-west part of Dragon Village on Hard Setting. After getting this Light Gem, charge into the switch you used earlier, and follow the platforms all the way up to the opening in the wall. Inside at the top of a series of platforms in the far-west section of Dragon Village. Also up there you'll find a firework to destroy a Strong Chest on one of the platforms. Now, just to the left of the entrance to this whole area, you'll see a cracked wall, charge into it. Through the tunnel, in the area at the end, you'll find a couple of archer Gnorcs who will appear as you get near to where they are. A simple flame will do, but you should avoid their arrows. Just at the end of a short stream in this area just after the aread with Sgt. Byrd's Mini-Game. Jump up to the open window of the building on your right. Just above a hole that leads down into the Professor's Lab. Talk to the Professor and he'll now let you out of his lab. You'll once again be back at the start. Go through the doorway that you unlocked first off. All the way back to where Ember is still standing next to that Dark Gem. Bring a Lock-Pick with you though. Right next to Ember just after the first locked gate of the level. Horn Dive it to destroy it. The bridge and surroundings will heal, talk to Ember again and she'll talk about you going over the bridge to a swamp. Ignore her pleas and go on over. There'a firework just over it which opens a Strong Chest with some gems inside. The last Light Gem of the level. Found locked in a chest just inside the entrance to Crocovile Swamp which is over the bridge fixed by Dark Gem #3. And that's all for Dragon Village. There is still one Dragon Egg left unfound though, but you won't be able to get that before you've opened up the pathway to Gnasty Gnorc. So on to Crocovile Swamp! The path to get there is along behind the chest where you found Light Gem #6. The journey there is very simple, just follow the tunnel along, and make sure not to fall off where there is a large gap. Jump onto the platform there and it'll take you over to the other side. You get three brand new tasks upon entering the level. Each of which is done one at a time, but altogether, if you get what I mean. The one above is the one you'll get completed first. Upon reaching Zoe at the start of the level, there's a Dark Gem Shard right in front of you. Destroy it and follow the path down to another tunnel, there's a piece of fire ammo on the left if you want it, watch out for the vines though. A simple tunnel with moving spikes coming out of the walls. Once you get to the end you'll see Moneybags with his shop, walk up to it and he'll tell you about his remote shop. You'll now be able to use his teleport passes which can teleport you to any one of his shops across the realm, providing you've walked over it at least once. To the north-west of the first of Moneybags remote shops in Crocovile Swamp. This dark gem raises up three large platforms which will allow you to get to the western section of the level. Follow those newly created platforms up to a cave where Zoe is waiting. Instead of going to the left in this tunnel at Zoe, charge into the wall on the right to open up a secret tunnel with a large spider in. At the end is a locked chest with this light gem inside. Continue along the main tunnel now, and follow it out into the large open area here. If you go over to the lefthand side of this place, you can find a firework that will destroy a Strong Chest over to the right. Once you've flamed it, head over to where the chest was, and then follow the platforms just to the west of it. Don't fall in the brown swamp, it'll kill you straight away. Also watch out for the large swamp tentacles which will pop out and try to knock you into the swamp. At the end of the set of platforms in the far west section of Crocovile Swamp. That's all for this section of Crocovile Swamp, you won't ever need to come back here if you don't want to. Anyway, head back to Moneybags shop again. Follow the steps upwards on the pyramid with the spikes moving on it. Make sure to jump over the gaps as they contain the same deadly swamp water as the swamp. Once you get right to the very top of the pyramid, glide over to the cannon to the north-west. Use the cannon to destroy the top of the pyramid next to Moneybags' first shop, and the Light Gem will appear there. Jump back down to ground level, and follow it around to the north-east now. Keep along the edge of the swamp, and go down to where the Professor's hologram is waiting. He'll tell you about his Supercharge Gadget, one that requires 40 Light Gems to be powered. You won't be able to do this for a while, so ignore it right now. Continue on past here, and as you reach a large doorway into a tunnel, go off to the right of it and follow a short path up to a locked chest. Past the temple, just before an entrance to a tunnel guarded by dragon dogs, go off to the right up to a locked chest which contains this egg. Now go into that tunnel you just avoided. Follow it round all the way to Zoe. Once out in the open, follow the large plants along (flame them) up to a switch on the ground. Horn Dive it to open up the front gate of the temple permanently. Head down to Moneybags' shop, then go upto the temple itself, making sure to kill everything that gets in your way. On the right is another switch to Horn Dive. It'll open up the temple fully. In the left-hand room of the temple near Moneybags' Shop 'Forgotten Temple', simply walk over the pressure button to open it. It's inside a locked chest. Now go into the tunnel dead ahead of the entrance. Another pressure button will open it up. Inside is a series of platforms, all above a bottomless expanse, with swinging axes as well as Gnorcs on several of the platforms. You'll need to time it right, jumping just as the axe gets out of the way, and flaming whilst jumping so as to avoid getting knocked backwards by the Gnorcs, or you could probably use the ammo if you wanted to be safer. On the way there, there is only one Gnorc and two swinging axes, however on the way back, there is a Gnorc on each platform and all the axes are swinging as well as some falling rocks too. At the end of a series of platforms in the room dead ahead of the entrance to the 'Forgotten Temple'. The path to the right of the entrance is currently unavailable due to the fact that you don't have electric breath just yet. You'll probably want to come back here once you've gotten that in order to get what's behind the door there. Now, out of the temple and continue on along to the south-west, follow the windy path along killing Gnorcs as you go. At the major curve around in the path, you should be able to see a slightly different coloured stone in the wall, charge into it and the wall will open up to this Light Gem. Finish up the tunnel to where Zoe is. To the left you can go along a couple of platforms to get to some gems, but there's nothing else so there's little point. Instead, go off and follow the path of platforms ahead of Zoe, and since you can't Pole Spin, just yet, keep following them until there's a split in the directions again. Take the right path of platforms, which rise and sink, and work your way up and around to place above the Zoe, which was just after Light Gem #10. Step on the small button in front of where the Light Gem was, and jump back down to Zoe. Follow the platforms along again, this time going left at the second split. And here, you should easily see Blink locked inside a wooden cage. Quite why it's never said, but step on the small button infront of him to release him. Say yes. This is the first of many increasingly difficult mini-games for Blink. First off to get a Dragon Egg, you'll need to get five Dark Shards, then on the second run through to get a Light Gem, there'll be more dark gems to get, ten in fact. Read the Help if you want to know how to control him, or just refer to the controls section of the introduction to this walkthrough. Wooden Crates can simply be shot or punched, Horn Dive chests require you to perform Blink's equivalent to Horn Dive, except that you don't need to double jump. Blink's bombs can be thrown a short distance and will stick to certain things. They are required for blowing up the Dark Shards as well as larger obstacles. Instead of Zoe everywhere, there are Blink Bomb rechargers which will save your progress in the current Mini-Game, so if you die and continue you'll go back to the last one you walked over with the amount of Dark Shards you had then. There are also several points that will require Blink to dig, these are in walls for getting around, and at certain points in the floor which will dig up a few gems. Trina will introduce all these things as you go along the level, eventually and in an annoying fashion. Anyway, with the level. Head straight ahead, and when you get into a pit with several green vines in, dig at the far wall which when looked at through your goggles, appears a light pink. Collect some bombs, and then proceed to use one on the cracked door on your right if you want some gems, and in HARD mode, there'll be a Dark Shard in here. Next, jump up onto the ladder type thing, and use Blink's wall kick ability (even if Spyro doesn't have it yet). At the top, shoot the large spider and drop a bomb next to the first Dark Shard. Jump down just past this (HARD: Dark Shard next to the bomb dispenser), and blow up a large stack of metal crates, you'll need to blow them up twice. And just beyond them are a couple of spiders and the second Dark Shard. Use the wall kick section here to get back up, shoot the spider at the top too. Jump up to the next level and then use the wall kick thing there too. At the top, shoot the two spiders across the large gap with dragon dogs in and then when the moving rock gets closer, jump onto the bottom of it and Blink will hold on. Wait for it to reach the other side and then drop a Blink bomb on the Dark Shard over there too. Drop back down the wall kick place, and dig through the wall to a new area. Straight away on the left is the fourth Dark Shard. Jump onto the stone platform nearby and wait for another one to swing by, jump onto the vertical surface and again Blink will hold on. Wait for it to get over to another platform and jump off. (HARD: On the platform just ahead is another Dark Shard to destroy) Wait for another, then do the same again. On the platform at the end (HARD: Use stone platforms to get up really high where there is another Dark Shard), jump down to the left where the fifth Dark Shard is waiting. 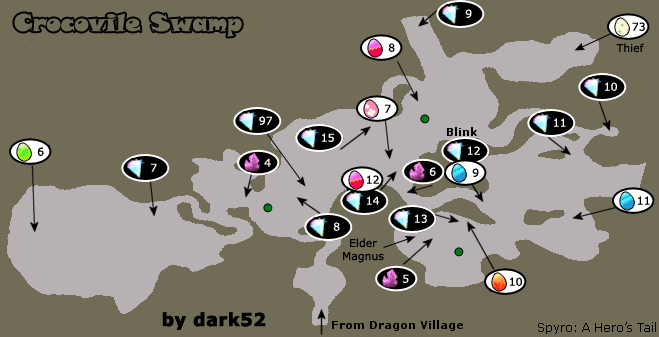 (HARD: In the middle of the swamp water is another Dark Shard). Complete Blink's mini-game on Easy Setting. Complete Blink's mini-game on Hard Setting. Once you've done both of those, head off to the left of his cage to where another Moneybags' shop is, Elder's Tree. Just past Moneybags' Shop, 'Elder's Tree' is this Dark Gem, it will open up Elder Magnus' treehouse. Head inside the treehouse and talk to the Elder Magnus. He'll explain a little more about Red, and then give Spyro the ability to Pole Spin. Use the pole over to your right on the wall to swing to a higher pole, then again to a platform. Charge into the wall just on the right on the first platform of the Elder's treehouse. Also light the firework if you want. Turn around and go back into the treehouse again. Jump up to the third level platform in the Elder's treehouse. There are a couple more uses for pole spin around here, but none of which lead to anything more than gems. So off back to where Blink was. Follow the platforms away to the left, and then onto the green land on the second fork. Pole Spin up to the top. Follow the platforms in here, to the second Gnorc (Crocovile?). Jump up to where he is. Behind a small fence in the far south-eastern area of Crocovile Swamp which can be destroyed with a small charge. Continue on through and you'll apear with Blink directly infront. Glide over to the platform above him, or just use the poles next to him if you don't make it. Watch out for the spiders of this tunnel. Right at the end of the tunnel above Blink's cage. It'll open up the entrance to where Fredneck is sitting. You'll need to talk to him to get further on. You'll once again be needing to complete this twice. Dragon Egg for the first go, Light Gem for the second. In order to win, you'll need to get the green side of the bar to full, you'll lose if the red gets to full. Complete Fred's turret mini-game on Easy. Complete Fred's turret mini-game on Hard. Now go off to the left using the lily pads. On the second lilypad after Fredneck the Frog, turn to the right and jump up to the Light Gem on the shelf. And that is the last of the collectables in this level that you can currently get. Once you've got both electric breath and 40 light gems, you should come back here in order to gather up the last remaining Light Gems and Dragon Egg. Glide down to the lilypad again and continue on the same way you were before. You should recognise the place, now work your way back to the beginning of the level and through to Dragon Village again. Find the Ball Gadget near to where the nursery is, and get into it ready for a trip to Dragonfly Falls. There's very little to do inside the Ball Gadget, simply work your way to the other end of the short path to get to the next level. Select No when you fall into the hole at the end. After getting out of the Ball Gadget, you'll appear next to Zoe inside a brown earthy cave. No new tasks just yet, so head forwards taking out the Crocovile as you see fit, either for lunch or a barbecue, your choice. Couple of self-raising spikes ahead, make sure to jump over the one that just went down. Continue on the short journey until you reach Zoe up a couple of 'steps'. You'll notice a crack in the wall ahead, there's only gems in there so pick them up if you want. Now turn around and look back the way you came, you should see a Crocovile on a ledge with a locked chest behind him. Simply glide on over there, and kill the Crocovile. In the locked chest by a Crocovile near the start of the level, opposite a secret gem cave. Once you've got that, jump back to Zoe and continue down the path outside. Once you get into the large green open-ish area, go over to the left and jump up onto a platform with a Crocovile on, smash into the cracked wall behind him. Some bats will fly out, flame them as they do or they'll hurt you. At the end of a 'secret' tunnel in the first outside area of the level. That Dark Gem will cause the place to lighten up a bit and will open up another small area. Inside the small area opened up by Dark Gem #7. Head out of this tunnel now, and continue along with the level. Moneybags' shop 'Steep Canyon' is right ahead. Continue on past it, buy another Lock-Pick if you need one, and as you get to them, flame the goats/rams that charge at you. Very similar to those of the first game, they even have a shephard behind them. Now, when you reach the shephard, turn to the right and glide over to the platform with a button on it. Horn Dive it to activate it. Go up the platforms and use the cannon on the top to destroy the large metal door over to the other side, it should already be perfectly lined up for you. Through a strong door destroyed by a cannon near the start of the level. Take that Light Gem, and smash the cracked wall on the right if you want some extra gems. If not, head back out again and once again it's back on with the level. Watch out for the spikes here, they hurt. If you need some free gems, go left and explore the region below and around here as you get out of the tunnel. Else, just continue on along the path to another tunnel with moving spikes in, though take the path that doesn't have them. Zoe'll zap you. Jump and glide over to the first of the platforms above nothingness, and then head off to the left. Over to the left of a series of bendy platforms, it opens up a cannon for use. Jump aboard that cannon, and shoot the large boulders across from you. Then, make your way over to where they were and use the cannon there to smash another boulder, you can also, and should, shoot the birds circling overhead. Use the newly cleared platform to get over to the green part, and go to the left end of it. Over a bottomless chasm on the left near Dark Gem #8. Now head off to the other end of the place where you landed and go through to the 'right'. Just before you exit the tunnel here, jump onto the boxes and then up onto a ledge on the left. You'll find a few gems as well as a door locked until you collect 70 Light Gems. You won't have enough just yet, but you'll need to come back later if you want to complete the game to 100%. Now head back to the tunnel again and out the end. You should appear in an area with a large stone Elder statue. Explore the area for gems if you want. Over to the right of where the Dragon Elder statue is looking, just before a pool of water. The pool will fill up further, jump in and smash open the cracked wall. Through a cracked wall which is only smashable by swimming into it. Head back out again. Jump to the left of the entrance to this area again and around the corner a bit to land on a place with a small knee-deep pond on it. Then glide over to a mysterious floating platform in front of the Dragon Elder statue. Jump up to another and then glide on over to the signpost with a picture of Sparx on it. This is the first of the Sparx minigames. As with all other mini-games, you'll go through once to get a Dragon Egg and a second time for a Light Gem. The minigame here involves you controlling Sparx and flying him down a tunnel with loads of bugs and things flying at you and attacking you. Sparx will appear on screen sort of like a cross-hair, but larger and gets in the way of your view occasionally, though you get a cross-hair too. Shoot continuously if you want, I highly recommend it. You'll want to kill the spiders that drop down as they will hit you if you don't, though the rest of the bugs can generally be avoided. Once shot the spiders will sometimes drop powerups, and the bugs will either drop gems or very rarely a butterfly to heal you. Your blue gauge will slowly regenerate so use it if you want to slow down or speed up at any point. Oh, and shoot the web when you get to it. Just get to the end to win. The only difference with Hard mode is that there are a few creatures on the floor who will attack you much like the spiders do. Complete Sparx Shooter on Easy mode. Complete Sparx Shooter on Hard mode. Now jump down to the right onto a platform with a Crocovile on it. Go down the tunnel, flame the bats as they appear and out to the large open area at the other end. Glide down to the right and land on a platform with Wicker Baskets round a palm tree. Charge and flame the Gnorc as it appears. Then charge into the cracked wall. Inside a cracked wall in the large watery open area after the Sparx mini-game. Reachable by using Wall Kick. Jump down to Moneybags' Shop, 'Tropical Cove'. Beware of the water, if is infested with piranhas. I don't believe that you can kill the piranhas here and I don't recommend trying. Over to the left of the entrance to this area, on a small island with a tree, you should find a locked chest. To the left of the entrance to the piranha infested water area, inside a locked chest. Collecting this 20th Light Gem solves the 'Collect 40 Light Gems' task in Crocovile Swamp for absolutely no reason whatsoever. Ah well. Use the floating wooden platforms to get across to the other side of the lake. On the western side of the pirana infested lake, it's on a short treetrunk. Now work your way over to the north-western side of the lake. On the left up the first step you should be able to see Hunter standing there. This is his first playable level. That's the whole point of this, though there is a Light Gem too. Unlike the other extra characters, Hunter isn't a mini-game guy, his levels are parts of levels and are just a simple change of character rather then being Spyro. If you want, you can turn around and shoot Spyro a few times. You've got Sparx so it won't hurt. Jump up the ledge here and go through a tunnel. Follow the platforms around, shooting Gnorcs as they appear. Try not to fall into the water below, this cat can't swim. Trina will give you some helpful pointers at controlling Hunter, though for the most part it's just common sense. On the ledges with Gnorcs that shoot at you, shoot them and then shoot the baskets if there are any, the gems will fly towards you so there's no need to try the impossible jump over to them. Once you reach Zoe again, go forwards a short way and then jump through the waterfall to a tunnel. In here you'll find a whole load of gems, a few Gnorcs and a couple of explosive arrows, similar to what Spyro has for a fire powerup, but more useful as they are required to be used if you want to get everything. Head back out again, and jump onto the climbable surface at the end of the path. This is really just a demonstration of what you'll need to do in later Hunter levels as there are only gems to be gotten this way. Head back again. Now continue along the platforms, take the path to the right and land on the ledge with some fodder on it. Use an Explosive Arrow on the cracked wall for some gems and another explosive arrow. Now back to the main track again. Quickly take care of the three birds flying around, and make the large jump to the dragon egg you can see. Work your way to the Dragon Egg in Hunter's portion of the level. Carry on past the egg, shoot the three Gnorcs left and work your way over the platforms to your prize. At the end of the Hunter portion of the level. Now just drop down, you're back at the start of the Hunter part, and walk back to where Spyro is waiting. Glide over to the green steps ahead and go up them to where an armoured Gnorc is standing, kill it of course. Wander along the path, you can drop down to the water level if you want, and into a large area, the last part of the level. There's a Light Gem in here which is unreachable due to the fact that you don't have Wall Kick right now. So instead, head over to the top of the first platform you get to in there area. Wait for a moving platform to arrive, jump aboard and let it carry you to its destination, though you will need to jump as it doesn't quite reach where you want to go. Remember I mentioned a Light Gem you couldn't get yet? Well, I lied. You can. At the end of the journey of this moving platform, jump off to the left and towards the Light Gem. You should be able to make it if you're lucky, Spyro will most likely grab on to the side. Reachable via a Wall Kick, near the Dark Gem #10. Now go back up onto the moving platform again and jump forwards this time. After a moving platform in the central area of the level. The wall will collapse and a task will be completed. You now have all ten Dark Gems of this realm collected, opening up the way to fight Gnasty Gnorc. Collect the gems and jump into what is now known as a 'thermal', it's basically just the same as a whirlwind from previous titles though, except Spyro looks like he's about to sneeze whilst he uses it. You'll also need to jump off from the top yourself. You might recognise the place now, you're at the place with the spikes coming out of the ground. You'll now want to be heading all the way back to the start of the level and getting back into the Ball Gadget to get back to Dragon Village, as the remaining Light Gem and Dragon Egg can only be obtained once you've opened the 70 Light Gem door. It's basically just left now and continue along until you get there. Head off to the entrance to his lair, the vines will disappear sharpish. Head in and you'll meet a small red dragon who goes by the name of Flame. As with Ember, this is the only time you'll ever see her apart from when you get all the eggs of her set. At least I think it's a her. Just after Flame and before Gnasty. Continue on past the egg and you'll get to a place where the game will take over for a short time, but shortly before that, you'll be able to see Gnasty in the distance. Sporting a new look, similar to the picture of him on the front of Spyro the Dragon, Gnasty has returned (properly) for the first time since the original game. No long chase sequence followed by one flame this time however. Gnasty's bar will appear onscreen with his little face on the right. He'll slam his club down to the ground, jump over the shockwave and go up behind him to flame his rear. He'll then smash the ground three times in quick succession, no chance to flame him yet though. Another slam which sends out mini tornados, and you can flame him a second time. Again he'll do the three smashes followed by a larger one, this time with more tornados, jump over them and flame him for a third time. This'll 'beat' him and save your progress against him. Talk about making it easy. Another burst of three, followed by a smash which starts rocks falling around, avoid them. He'll eventually do another single smash which will again leave him vulnerable to flaming. This will repeat the first part again, but with rocks falling around, flame him two more times to get to another save point. He'll do the three burst, and then turn his club into an electrical weapon, charge round him keeping just ahead of it, then once he stops he'll do a single smash again, and he's a ripe for a flaming. He'll now instead of having the thing chase after you, he'll smash one at floor level to jump over, and another at jump level to go under, make sure not to mix them up. Flame again. Next he'll change it to short bursts all the you will need to jump over. Flame him one last time to defeat him properly. A fairy called Amp appears out of Gnasty's club and gives you the ability to breathe electricity now. Press Up to switch to it, Left to switch back to fire breath. Jump onto the platform ahead and use the electricity to power the metal thing on it. The platform will now start moving along out of the cave. It'll require a second burst about halfway and a third too. Once you get to the end jump off and head back through to Dragon Village. The Professor will start yattering on about his Teleporter and how it's better then Moneybags'. You'll appear on the teleporter, simply press to activate it and you'll be given a screen with Dragon Kingdom on it, press R/R1 to select Lost Cities, then press to teleport there. The usual teleporter loading screen will appear. in the place where you start there is alot of bees by a tree and they have smiles on them. I hate how the swamp level is so.... disgusting! Except for the frog guy.